My friend Jack Pitney, a political scientist at Claremont McKenna and Reason contributing editor, is donating a kidney to one of his wife's relatives today. UPDATE: A day after surgery, Jack emails that "all went well. The transplant was successful and I'm having very little pain or discomfort." In my latest Atlantic column (link good for three days), I look at how George Hurrell created the iconic photos that defined Golden Age Hollywood. The column is adapted from a longer essay I wrote for the catalog to a major retrospective exhibition of Hurrell's photos, which will open at the California Heritage Museum in Santa Monica in January. Yet these photos weren't entirely artificial. Not even the most gifted photographer can create charisma with only lights and a retouching pencil. 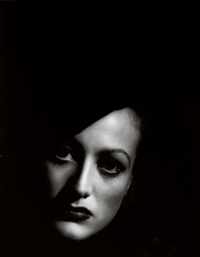 Hurrell didn't invent Joan Crawford's drive or Jean Harlow's sexuality. Rather, he encouraged the stars to reveal their inner selves to his lens. Then he intensified their defining qualities, while creating mystery with light and shadow. True enough for clearly defined personas as Crawford and Harlow (though, as the article goes on to explain, less so for Garbo). But I'm skeptical at how reliably something as genetically determined as facial appearance can reveal character. Maybe we want to believe we can see character in a good portrait, because that would suggest we can accurately judge character from the faces we see every day. Before they were comic superstars Trey Parker and Matt Stone applied their unique sense of humor (with fewer potty jokes and more wine coolers) to an corporate film introducing Universal Studio employees to their new owner, Seagram Co. The video is too long but still pretty funny. The utterly disinterested American Medical Association is calling on state and federal agencies to investigate health clinics in stores like Wal-Mart for conflicts of interest. As you might gather from the post below, I've been reading Giorgio Vasari's Lives of the Artists . Unfortunately, the book is all about artworks but has no pictures. I'm familiar with some, but not all, of the many works cited, and even when I have a general memory, I'd often like to see a detailed photo while reading Vasari's commentary. If ever there were a text made for the Web, this is it. I haven't found a site that integrates text and photos (or links), but this one certainly provides a useful supplement to the book's footnotes. Here's another product of Vasari's imagination, a detail from the Last Judgment he painted for the ceiling of the Duomo in Florence. The image, which was designed to be seen from much farther below, is somewhat distorted by the curve of the dome. When we were up there looking at the ceiling last summer, another American visitor said, "So, does it make you a believer?" Not exactly. Bad Taste Is An Externality. Now What? Our daughter commented yesterday that "almost all cars are silver or gold, which are boring colors" and that "you should only be allowed to have a boring color if you pay extra for a special permit." We weren't sure we agreed with her evaluation of the external effects of car colors, but we were delighted that she'd learned you should use a tax to address an externality! This cute example raises a fundamental question: When does correcting externalities start to offend principles of liberty? Imagine your next door neighbor made some horrible aesthetic choices: He cut down all his trees, paved over his lawn, boarded up his windows, painted his house black, and adorned his new black top with statues reminiscent of Edvard Munch's The Scream. Would scaring local children be a negative externality that warranted government intervention? If not, what principle distinguishes this externality from, say, pollution? If so, how far are you willing to go imposing community tastes on others? You don't have to go all the way to the Edvard Munch example to find people declaring their neighbors' aesthetic choices "visual pollution." And even someone as tolerant as I am has limits. (Here's a bona fide artwork I'd find it intolerable to live near.) The offended often claim that the neighbors' bad taste is driving down property values. There's rarely much evidence in individual circumstances, but since people do pay extra to live in associations that, among other things, regulate asthetics, the argument isn't entirely fallacious. I addressed this topic at length in chapter 5 of The Substance of Style (excerpt here). One aspect--neighborhood conflicts over paint colors--is the subject of myJune Atlantic column. (Link good for three days.) As I argued in this NYT column (and in the book, though not the excerpt), the best thinking on the general issue is Ronald Coase's classic paper, "The Problem of Social Cost," which has a more complex message than the usual one captured with the term "the Coase Theorem" and represents a devastating critique of the simple Pigouvian formula. There is no way to please everyone, which is why it's best not to try. Allowing people to sort themselves is one step toward resolving the dilemma. Another is to eliminate cheap talk--not through a strict Coasian bargain, which is rarely possible, but with enough trouble and expense to eliminate frivolous enforcement (or frivolous violations.) In this Dwell article (in two parts, one page each), I looked at some examples of reasonably effective hodge-podge solutions--though, as the Atlantic column suggests, uncertainty itself can lead to conflict. A cloth weaver came at one time to live next door to Sandro, and set up eight looms, which when they were at work not only deafened poor Sandro with the noise of the treadles, but also shook the house, so that there was no wall strong enough to stand it, and with one thing and another it was impossible to work or to stay in the house. He asked his neighbour many times to put a stop to this annoyance, but he only answered that in his own house he could and would do what pleased him. Then Sandro, getting angry, set up on his wall, which was higher than his neighbour's, and not very strong, a huge stone, poised so that every time the wall shook it seemed to be just about to fall and crush the roof and beams and the looms of his neighbour. The man, alarmed at the danger, came running to Sandro, but he gave him answer in his own words, that in his own house he could and would do whatever pleased him; and the weaver could get no other answer, until at last he was forced to come to terms, and be a better neighbour to Sandro. Clear thinking on immigration from Jonathan Rauch. On the legal side of the immigration equation, there are easy trade-ups to be had. In fact, even a National Journal columnist with no apparent qualifications could write a better bill. And what might that look like? Glad you asked. First, raise the number of legal immigrants by about 50 percent, to about 1.8 million a year. That meets the economy's demonstrated demand for workers. Second, provide pathways to permanence. Bring in these 1.8 million people on temporary visas, say for three to five years, with the promise of permanent legal residency (a green card) if they stay out of trouble, pose no security risk, and work or get a college degree. Third, don't micromanage who gets in. Allocate visas using a simple three-way formula that gives about equal weight to family, work, and education: 600,000 family visas for close relatives of citizens and green-card holders; 600,000 work visas for people who are sponsored by an employer and have less than a bachelor's degree; 600,000 education visas for people who hold a bachelor's degree or higher, with first call going to those who also have employer sponsorships or family ties. There is no chance, at the moment, that this plan will be adopted. But there is some chance that making the case for it might help clarify what the country should be shopping for in an immigration reform measure. Of course, the last thing policy makers want, or the public will countenance, is a rational assessment of the real-life demand for immigration, which would imply a substantial increase in the number of legal immigrants (not guest workers) across a wide range of skills and occupations. I spent the weekend in Philadelphia, attending a board meeting for The Foundation for Individual Rights in Education (FIRE). The bad news is that FIRE is as busy as ever, as too many universities routinely fail to live up to their promises of free speech. The good news is that FIRE wins almost all of its cases, often with as little as a letter to the administration. FIRE's president Greg Lukianoff reported a few trends, including an increase in the use of harassment rules to squelch "anti-Islamic" political speech. Overall, however, the level of "offensiveness" required to trigger school action seems to be rising. Of course, that puts FIRE in the position of defending ever-more obnoxious people in order to safeguard the rights of everyone. Why do that? I address some of the reasons in an article in FIRE's newsletter (see page 10). Check out FIRE's blog for specific examples of current cases, including Tufts' crusade against the campus conservative newspaper, where FIRE's opposition to blatant censorship has been joined by the Massachusetts ACLU. As always, I encourage you to support FIRE financially. Click here to do so. I'm not sure I entirely agree with your blog entry on 'What Are Magazines For'. The model you describe certainly holds true in the US. However, in the UK and elsewhere in Europe it is possible to publish magazines that survive solely on the basis of their circulation revenue (barring some small, specialised advertising revenue). The company I work for, BBC Magazines, for example, publishes 'Sky At Night', an astronomy magazine. The circulation is only 30,000 but it can charge a high cover price because it is linked to a community of interest that is passionate about their subject and prepared to pay. I think that point is key--that a magazine's abililty to tap into a community of shared interest is still valid (and growing) in specialised markets. Consumers in that space want longer, more in-depth and contemplative pieces, and are less keen on 'burst' delivery of content. I'm the Head of Licensing for BBC Magazines, by the way, and reached your piece via Warren Ellis' website. Sothe real question is, Why are Americans so cheap? Why won't they pay enough for magazines to support them without lots of advertising? UPDATE: Tim Worstall is highly skeptical that BBC Magazines could make it without all that free TV advertising. "If your concept of a magazine is something designed in one-page bursts, or three pages that only carry 500 words due to the mass of images, then, really, you're not doing anything the web can't do better, are you?" writes Warren Ellis on the "burst culture" of the Web. I saw that shortly after reading Paul Berman's 28,000-word TNR essay on Tariq Ramadan--a great, if extreme, example of what a serious magazine can publish. Long essays--4,000 words-plus--are ideally suited to magazines, and satisfying to read in that format. It's not clear, however, that there's an advertising market to support them. So medium-sized ideas tend to get chopped down to column length or blown up to masquerade as books. I've often said that if I were still editing Reason, I'd redesign the magazine to put all the short stuff on the Web and just run long features in print. But then Reason, like TNR and the rest of its think magazine competitors, is a subsidized publication that long ago realized it has no significant ad base. The other thing magazines can still do better than the Web is publish photography with high production values. And they're still a lot more portable than a computer. I can't surf the Web while getting my nails done or, for that matter, flying cross country.